Quite a hectic day it was shuttling between two rooms. Real Madrid vs Betis on my PC and on the other room the Barcelona derby being shown on the TV. Story of two halves I should say…the first one being a typical exhibition of Real Madrid's attacking flair football in which six goals were scored but in the other half the happenings at the Camp Nou took precedence. 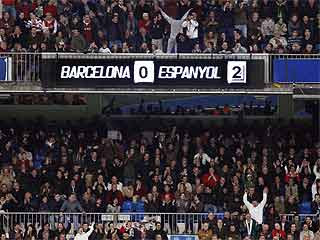 Former Barca discard Ivan de la Pena scored twice against 10 men Barca to send the 80,000 strong Bernabeu faithfuls into ruptures and silencing their more illustrious cross town rivals. Tables were starting to turn and memories from the past were coming to haunt them when two years earlier Raul Tamudo scored very late in the Catalunian derby to spoil Barca's chances of catching up with Real when the latter drew 2-2 at the La Romereda against the now relegated Zaragoza as the Capello led Real Madrid turned around the league on its head and completed the most incredible comebacks in the history of La Liga. A lead of 12 points have been cut to 7 in a space of two weeks as Real Madrid surge forward in their quest for their 32nd la liga title.There is no denying the fact that Madrid has been in their hottest streaks ever in their recent history,winning 10 games out of the 11 played under the new manager Junade Ramos. The floodgates opened at the 7th min when Argentinian hitman Higuain danced his way around Betis defense to put the ball in the back of the net. Huntelaar followed suit with two goals of his own, although both were from rebounds .. but it was a Klass act to say the least. Ricardo Oliviera did something which he could not do last year with Zaragoza…ie beat San Iker at the Bernabeu. Pulling back one for the Balompies didn't help their cause much because 35 mins into the clock started The Raul Gonzalez Show. Two goals in the space of 7 mins for El Siete brought the Bernabeu to their feet and Paco Chaparro at his wits end. The first one being a scorcher for which Ricardo had no answer and the second one being his typical trademark which had Raul Gonzalez written all over it. Collecting a pass from Gago, El Capitan showed immense cool that would even put a refrigerator to shame and lobbed the ball safely home much to the dismay of Ricardo and the entire Betis backline. Sergio Ramos was not to be left behind. After assisting hunter for his second , this time it was his own turn to find a mention on the score sheet. A flying header from a Heinze free kick did it for him .It wasn't even half time and Real Betis had been hit for a six . The second half had no more of the free scoring flair run that had resulted in six goals in the first half.Guti,Snjeider and Robben all got minutes under their belt ahead of the Liverpool match as Juande Ramos decided to consolidate the defence. But by then news had started filtering in that de la Pena had struck against 10 man Barca. Madrisimos on Orkut chat room forums went beserk .Just as when we thought it cant get better …the improbable happened again…de la Pena scored again. YES…lightning did strike twice. The Bernabeu blew its lid. It was a double treat for all of us. The 80,000 Madrisimos at the Bernabeu and a million more all across the world. Delirium turned to nervousness when Yayah Toure leveled one back for the Balugranas . but Sergio Sanchez and co held the backline very well and saw Espanyol through the rest of the match. The once untouchables Barcelona are just 7 points ahead with the El Classico still to be played at the Bernabeu….but for now its not about Barcelona…….Bring on Liverpool. LOL this man... just when i write he is an old gem somehow he goes polishes him self to shine...the goal he scored wasn't a chip.. no the man looked down lifted the ball over the poor victim and followed its eventual course into the goal in a matter of seconds... Goes to show that he is not the best but a Class of his own.